POINT DE SUISSE is an art project with a socio-political character that takes place in the public space, in the museum, and on the Internet. 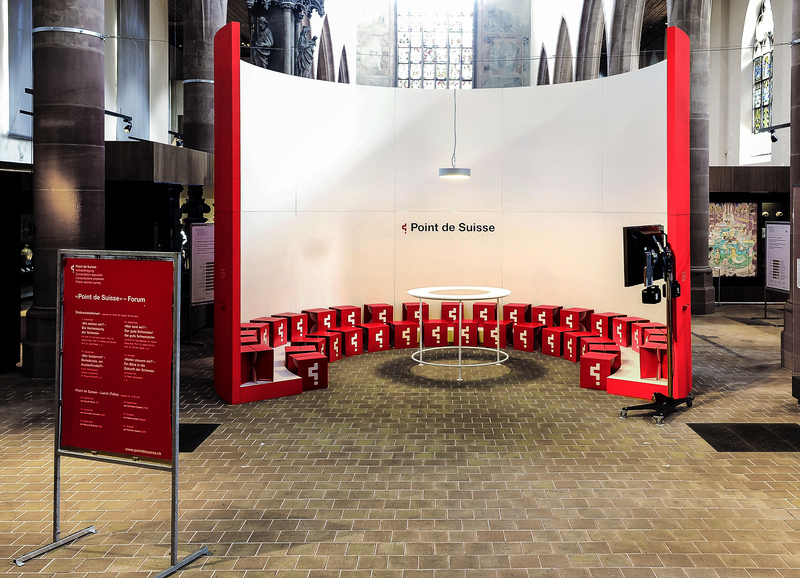 Prior to the federal elections of October 18th 2015, a playful survey interrogates the Swiss on their homeland, political opinions as well as on fundamental values such as work, hopes and fears. The data gathered will paint a portrait of today’s atmosphere in Switzerland. A representative survey, whose results will be published here in September, announces the launching of a second public survey. Next to that, a selection of questions from the survey will be displayed in the city of Basel in the form of a poster campaign, inciting creative interactions with passers-by, inviting people to take part in the online survey and to visit the exhibition and the discussions forum at the HMB – Museum of History Basel. In the museum, the results will be presented in a visual form and discussed by experts in interaction with the audience. At the exhibition’s closing, a book will be published by Christoph Merian. The project was conceived and led by a team of artists and researchers, amongst which: the Swiss artist duo Com&Com, the art group IIPM, as well as a group of sociologists and cultural anthropologists experts from the University of Basel.